Continuing with what I promised in the last post, this time around, I'll go on posting about a dangerous plant enemy- The Hornworm (Manduca Sexta) also known as tobacco hornworm or goliath worm. This plant enemy appeared in my gardening space during the monsoons this year. Appearance of this plant enemy was a suspense for me too, because I didn't expect a worm of this size to be carried over by some bird or something. Moreover, since my gardening space is at a height of 12 feet above the ground, this too made its appearance more of a surprise for me. 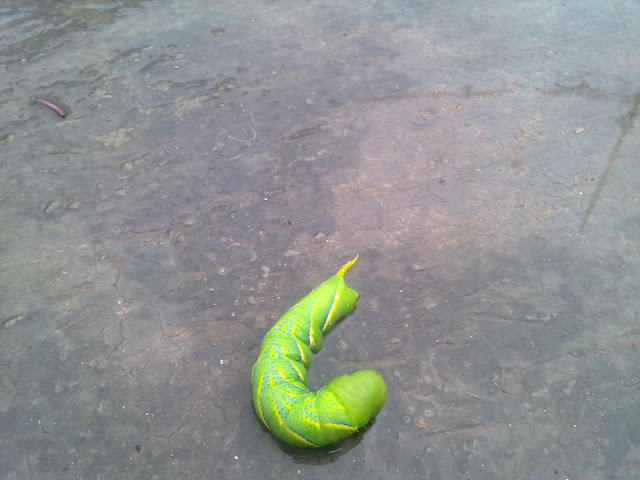 I came across this creature during one of my regular visits to the place. I noticed something odd in one of the pots. At first instance the thing appeared to be some papaya seeds, but on close examination it appeared something else. And as I was examining it, I came across this huge worm rearing on one of the holy basil plants. The speed at which it was eating on the leaves was just astonishing. Had it went unnoticed the entire plant would have gone without leaves. Anyways, let us have a look at the creature we are discussing, with some more info from wikipedia. Manduca sexta is a moth of the family Sphingidae present through much of the American continent. 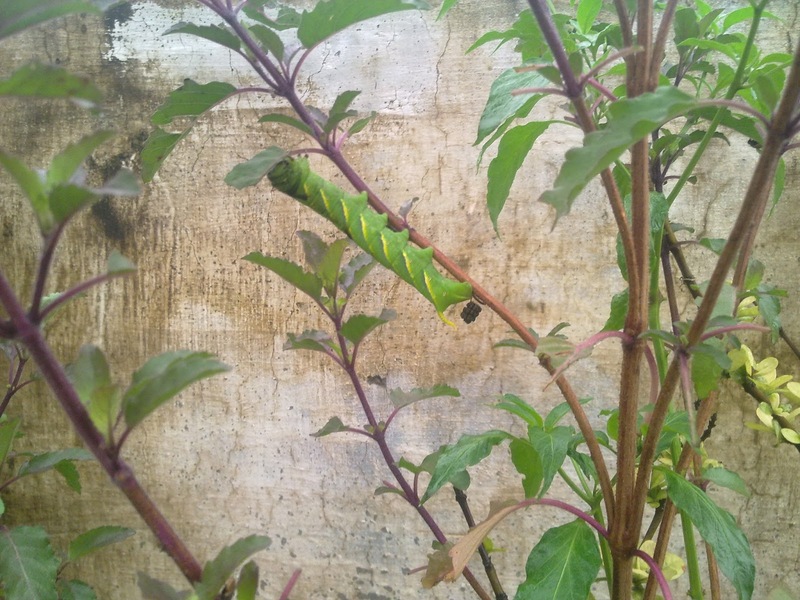 Commonly known as the tobacco hornworm and the goliath worm, it is closely related to and often confused with the very similar tomato hornworm (Manduca quinquemaculata); the larvae of both feed on the foliage of various plants of the family Solanaceae. The tobacco hornworm is sometimes kept as a pet by children throughout its range. It can be distinguished by its seven diagonal lines on its sides; tomato hornworms have eight V-shaped markings. A mnemonic to remember the markings is tobacco hornworms have straight white lines like cigarettes, while tomato hornworms have V-shaped markings (as in "vine-ripened" tomatoes). M. sexta has mechanisms for selectively sequestering and secreting the neurotoxin nicotine present in tobacco. So, I, not having a background in biology or botany or zoology, had a hard time recognizing this creature. And once I found out what it could possibly be, it was hard to distinguish with the other species, a close relative the "tomato hornworm". And a careful read through the wikipedia article made it clear what it actually was, the tobacco hornworm, or goliath worm. The hornworm's droppings which in too much quantity in one of the pots just below the holy basil plant it was feasting on. 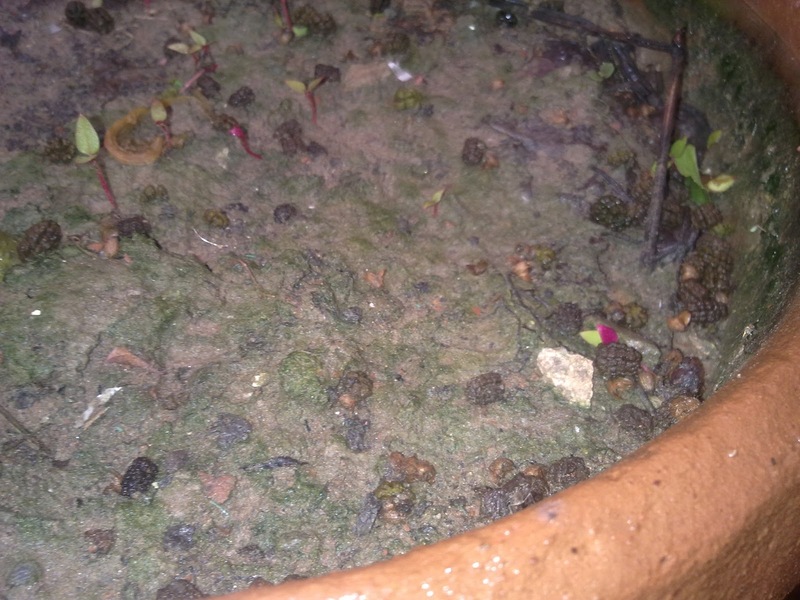 The black things are the droppings of the hornworm, who was feasting upon the leaves of the holy basil. This was the one thing that made me suspect something on the green foliage of my plants. The hornworm, feasting on one of my holy basil plants. The creature and its droppings. This was the one evidence that I was looking for to ascertain the presence of those black droppings. The hornworm, a closer, much clearer look. The hornworm, which, I somehow dislodged from the plant. This was a good position to capture it in a much better way, before I dumped it off somewhere where it wasn't possible for it to come back and cause further damages to any of my plants. This is an interesting read. Glad to stumble upon your blog.